William C. Knighton, Oregon State Architect, designed this stuccoed reinforced concrete building. The exterior conveys the character of medieval fortifications typical of armories of the period. This castellated style is combined with elements borrowed from the Pueblo style of New Mexico. 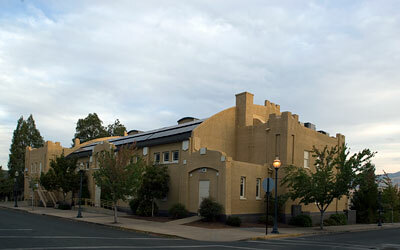 The Ashland Armory was the sixth of eight armories built in Oregon prior to the country's entry into the First World War. It is one of the best preserved National Guard facilities in Oregon. Adapted from the NRHP nomination submitted in 1987.